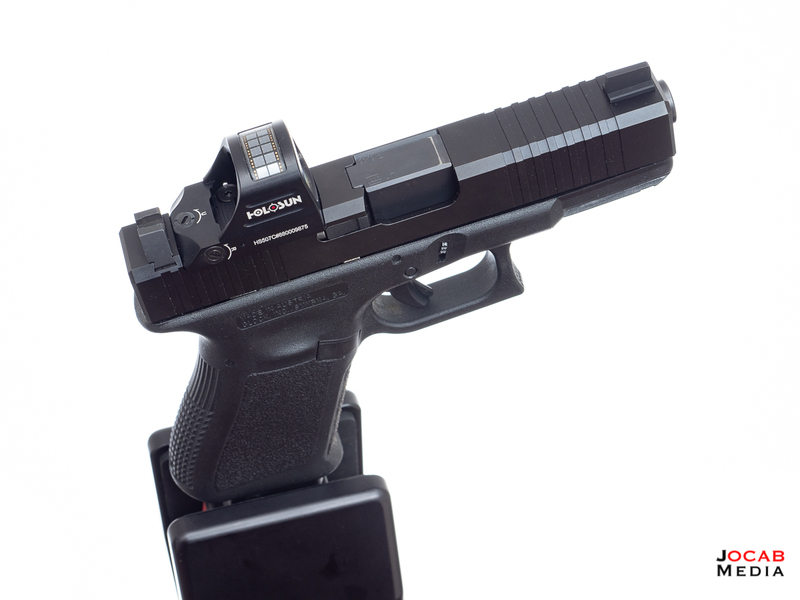 Red dot sights on handguns have become commonplace in the past few years. Granted, competition shooters in bullseye and IPSC have been using red dot sight variants for a long time. 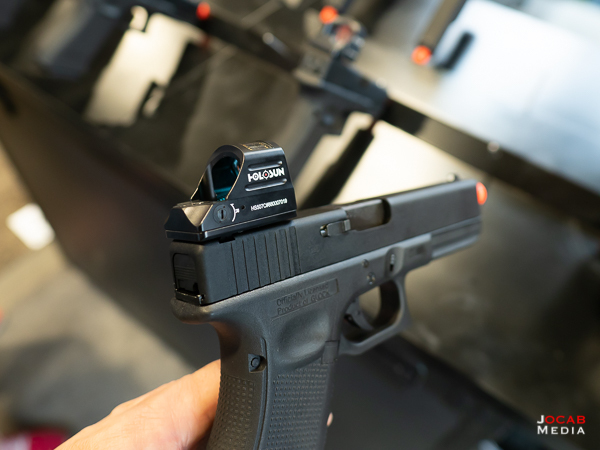 Only when someone decided to put a Trijicon RMR on a Glock slide did people realize the potential for smaller, micro, or reflex style red dot sights on defensive pistols. 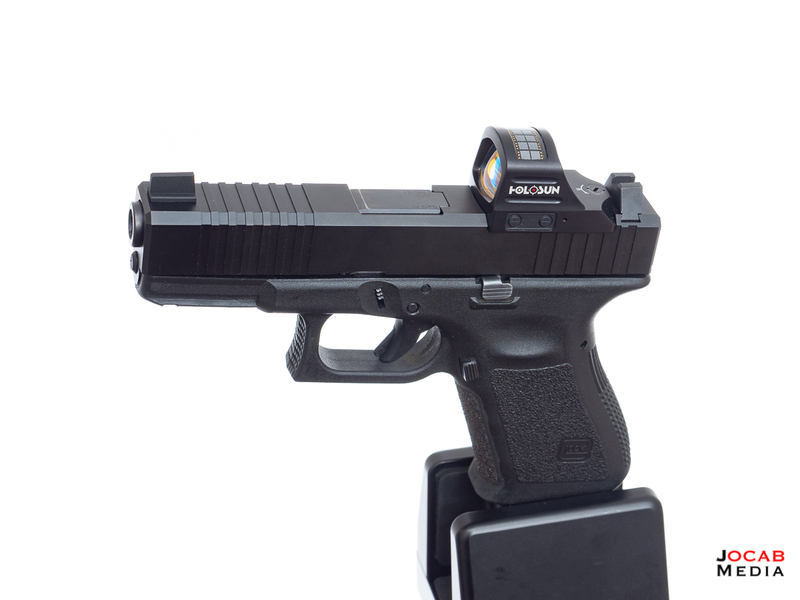 I tried the Trijicon RMR on the Glock 17 platform back in 2013 and it was great when it was working. 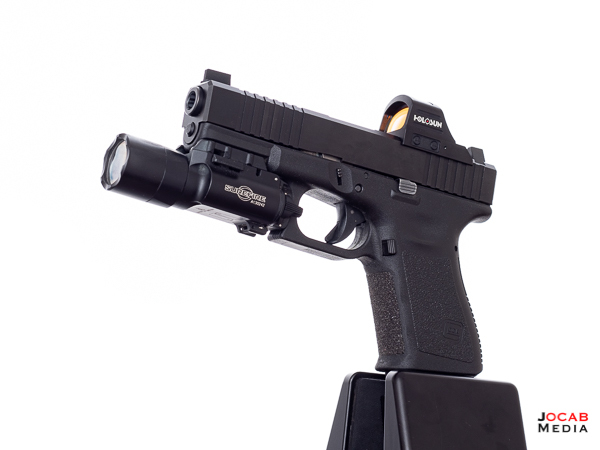 But I ended up going through three Trjicon RMR RM07 (adjustable LED) units. 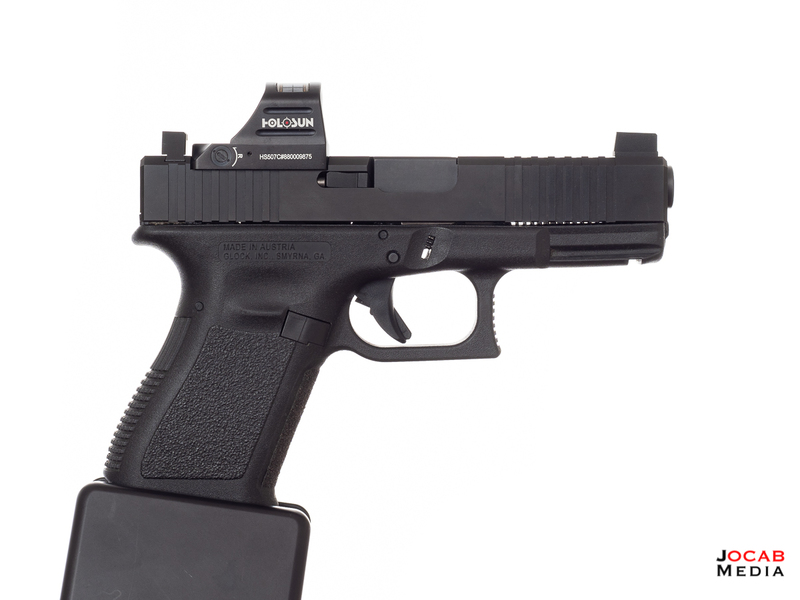 Glock 17 with Trijicon RMR holstered in Raven Concealment Phantom LC, but not on author’s hip. The first one lasted about a thousand rounds. Then on one range trip while I was shooting, the front lens element came off the RMR and it was lost in the snow. I exchanged it with Brownells (100% lifetime satisfaction guarantee) and the second RM07 unit was dead on arrival. It would not power on. I then exchanged it for a third one and that lasted about a year or so. Throughout that year I would occasionally experience weird issues, specifically when the brightness of the RMR would change under recoil. It would sometimes get really bright or dim really low. Then after a year or so and a several thousand rounds later, the windage adjustment completely failed where the dot was moving freely left to right under recoil and would not move when attempting to adjust. I ended up sending the RMR back to Brownells with a letter explaining my issues and they refunded my money. Fast forward to nearly five years later. 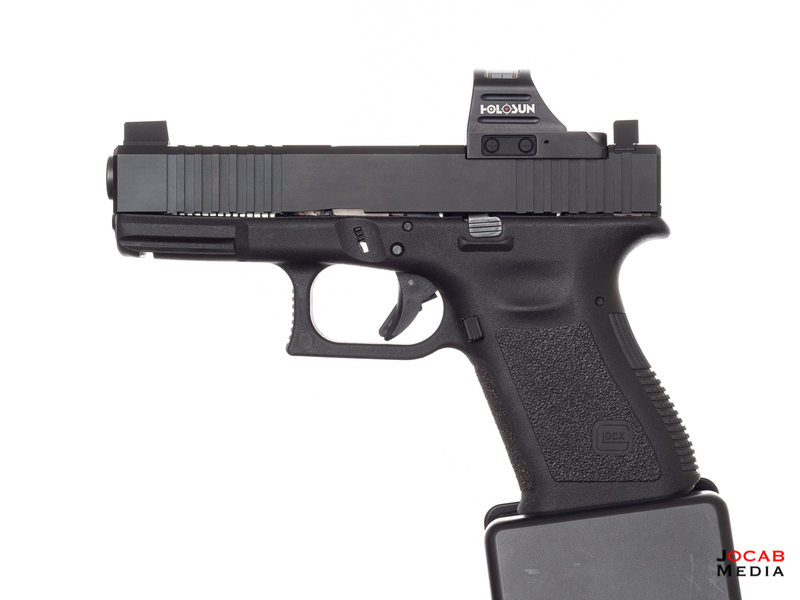 I found myself still wanting to give a red dot sight on the Glock another try. My eyesight is an uncommon situation where I have a hard time shooting iron sights due to how my eye cannot change focal planes on it’s own anymore. I have my corrective lens for my dominant eye setup for infinity, so red dot sights, reflex sights, and other optics work great for me. As much as I wanted to give a pistol mounted red dot sight another try, I was not in the mood to risk another $550 on the Trijicon RMR, even though they are on a new revision (Type 2). But then I got turned onto the Holosun 507C. The Holosun 507C (HS507C) has been getting a good word of mouth because it is a red dot reflex sight in similar form to the Trijicon RMR. 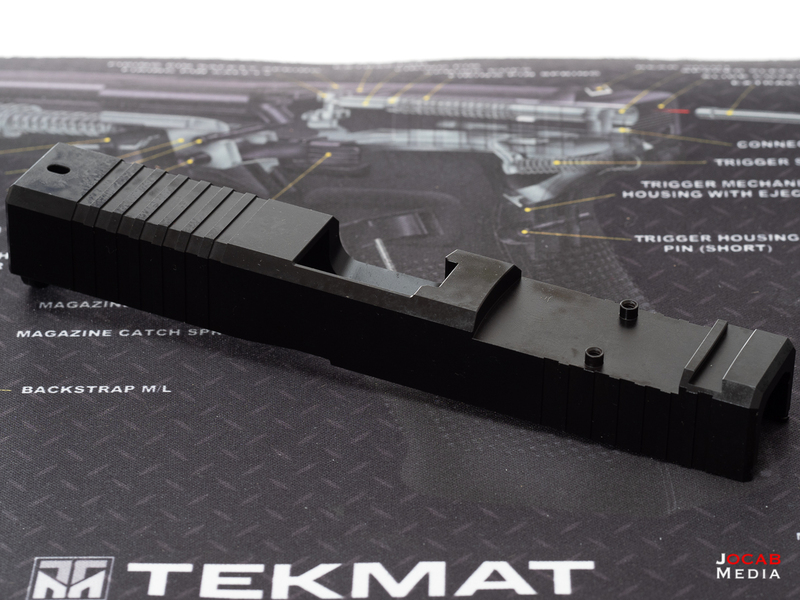 So similar in that it has the same footprint as the RMR, meaning that the Holosun 507C will fit on any slide milled for the Trijicon RMR. 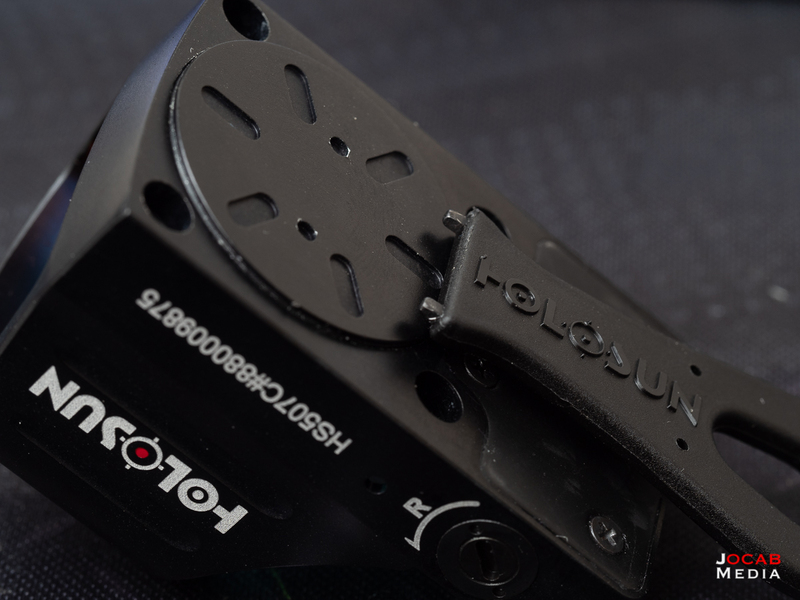 Furthermore, folks who tried the Holosun 507C have claimed it actually holds up to pistol recoil and appears to be built solid enough to handle the stresses from the slide recoiling. At the Holosun booth during SHOT Show 2019. I started to look for one and the price is fair at the widely accepted $300 USD price point, but the Holosun 507C has been so popular in the past several months that it is out of stock everywhere. Fortunately I was alerted of availability of the 507C at Kenzie’s Optics and was able to score one from them. 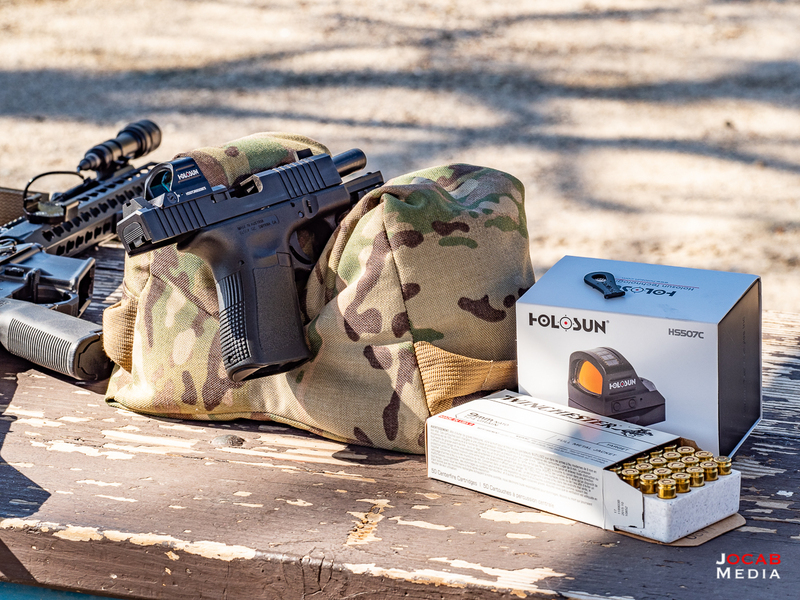 Out of box the Holosun 507C has a look of quality even at the lower price point compared to a Trijicon RMR. 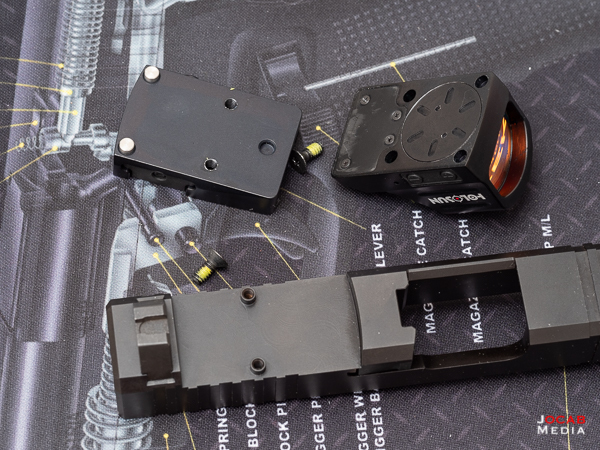 The unit is made out of 7075 T6 aluminum and comes with a Picatinny rail mount which is removable to expose the RMR footprint that allows it to be direct mounted to any RMR compatible mounting point. 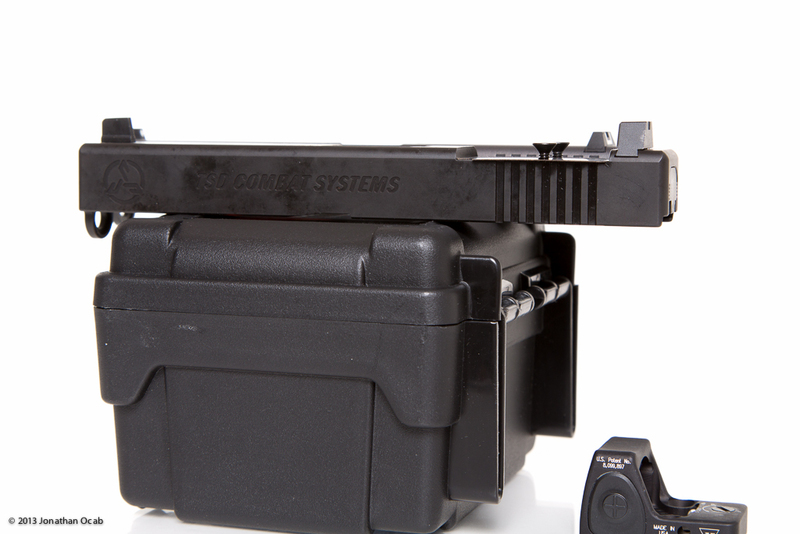 One notable difference between the HS507C and a Trijicon RMR is that the battery is not exposed on the bottom of the unit. There is actually a threaded battery cover on the bottom that keeps the battery sealed in place. Note that this cover requires the included tool for removal. 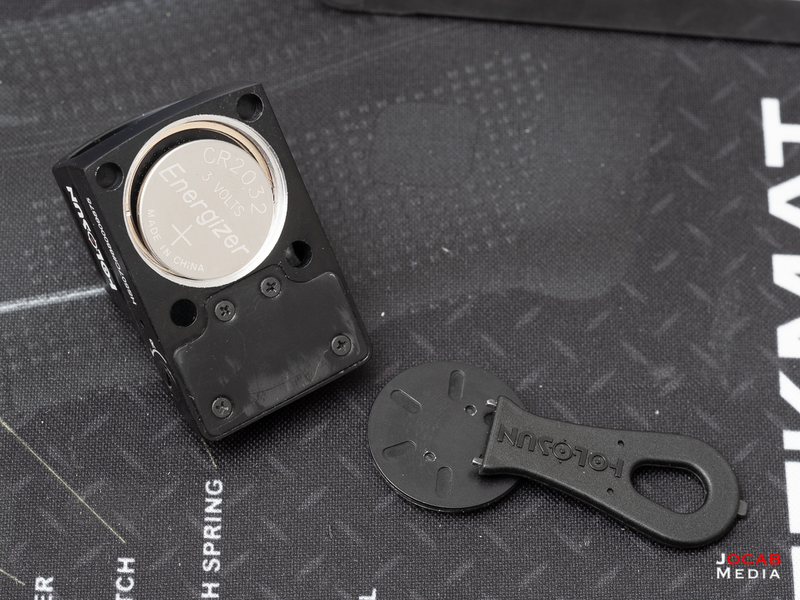 The HS507C uses a CR2032 battery. The 507C will operate for 10 years (on a power setting of 6) on a single battery. Just like the Trijicon RMR, the HS507C must be removed from the slide in order to access the battery compartment. But the kicker with the HS507C is that there is also an integrated solar cell (“Solar Failsafe”). 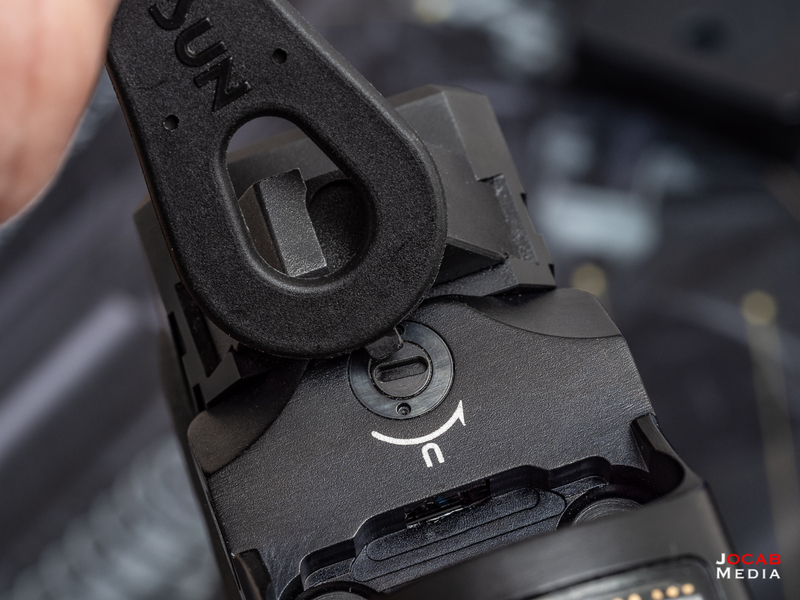 If there is enough sunlight, the solar cell will actually power the reflex sight instead of the battery. 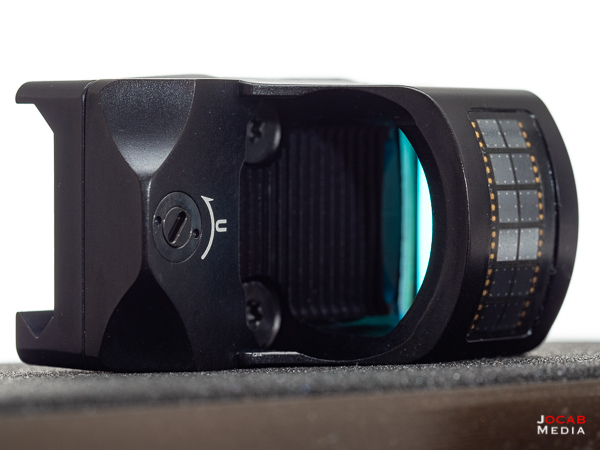 When the solar cell is does not get enough light to power the optic, then the 507C will draw from the CR2032 battery. The HS507C also has some intelligent modes of operation as part of the design. It can operate in an auto or manual mode, where “auto mode” will result in the brightness of the dot to auto adjust to the prevailing lighting conditions and “manual mode” will result in the dot brightness to remain at whatever it is adjusted to by the operator. There is also an auto power off with a “Shake Awake” feature where the dot will turn off after 10 minutes of being idle (no movement). But the optic will turn back on if it senses movement (e.g. jostled as pistol is unholstered). The 32MOA circle is similar to that of an EOTech. I find that reticle too messy on a pistol application and prefer just a simple dot. 13 illuminance settings, 10 day, 2 night vision, 1 off. Note: IPX8 means it is rated for immersion in over 1 meter of water, but the ‘X’ indicates no tested dust particle resistance rating. It is important to note that this product is manufactured in China since lots of people do take into account where something is made. Obviously, this factors into the cost and explains the lower price point for all the features on paper, but does not necessarily factor into quality of a product. 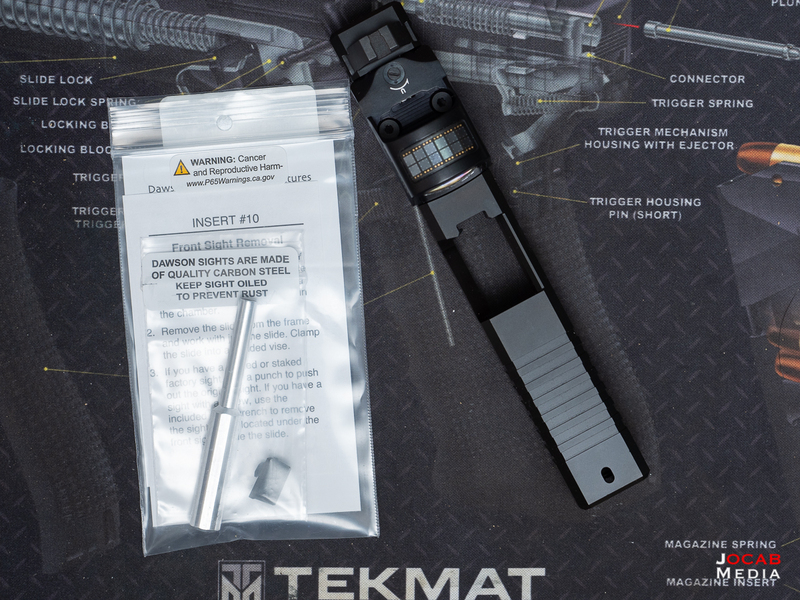 But it is something to keep in mind when choosing an optic or any other critical piece of equipment. I decided to acquire a new slide that was already milled with an RMR cut and chose the Brownells in-house Glock 19 Gen 3 slide with RMR cut. Rather than repeating with the Glock 17 platform that I initially ran the RMR on several years ago, I opted to run a red dot on the G19 platform this time around because this specific Gen 3 G19 is usually with me at the range. The Brownells RMR cut slide was on sale for just over $160 so it seemed like a decent buy. Aside from the fact there was a minor ding in the slide at the ejection port, the slide appeared fine. Arrow denotes slide damage out of box. 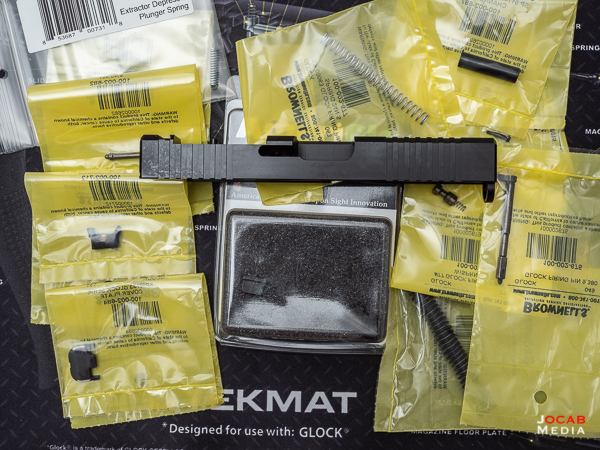 I ordered all OEM parts to build the slide up, but ended up taking the firing pin assembly and firing pin safety from the slide of the G19 I was going to install this on because those parts were actually from a Haley Strategic Skimmer Trigger kit. I had a spare Ameriglo rear suppressor height sight leftover from my prior Glock 17 with RMR project, but needed to get another .315″ tall front sight. I picked one up from Dawson Precision. Installing the HS507C was straight forward. 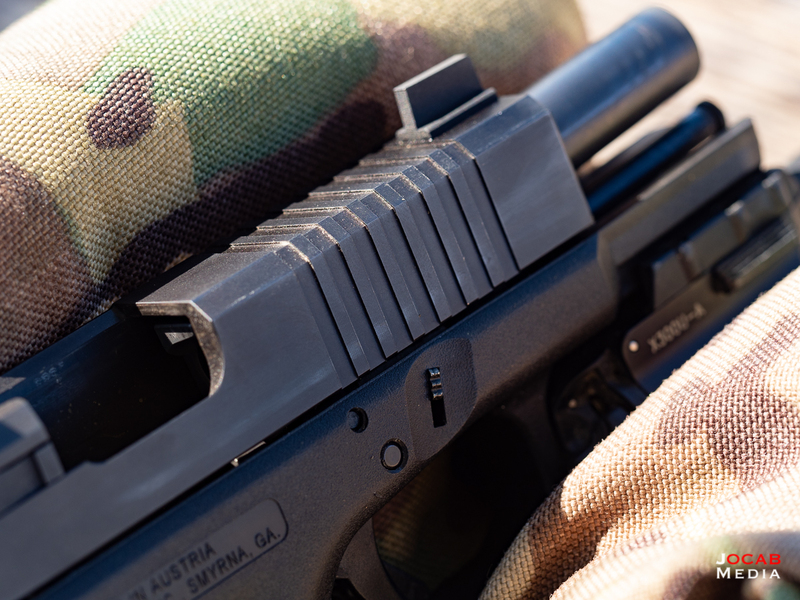 The Brownells RMR cut slide has posts where the sight screw holes key into, which is great for added support for the red dot sight, and require the use of the included Brownells screws. There is very little clearance to get a vertical angle to the screws. Instead of using an Allen key, I used a longer impact-style T10 torx bit so I could use an in-lb torque limiter. I went with 15 in-lbs. Note: The manual indicates recommended torque for mounting is 1.7Nm to 2.2Nm (~15.05 in-lbs to ~19.47 in-lbs). After everything was setup the overall platform looks pretty slick. 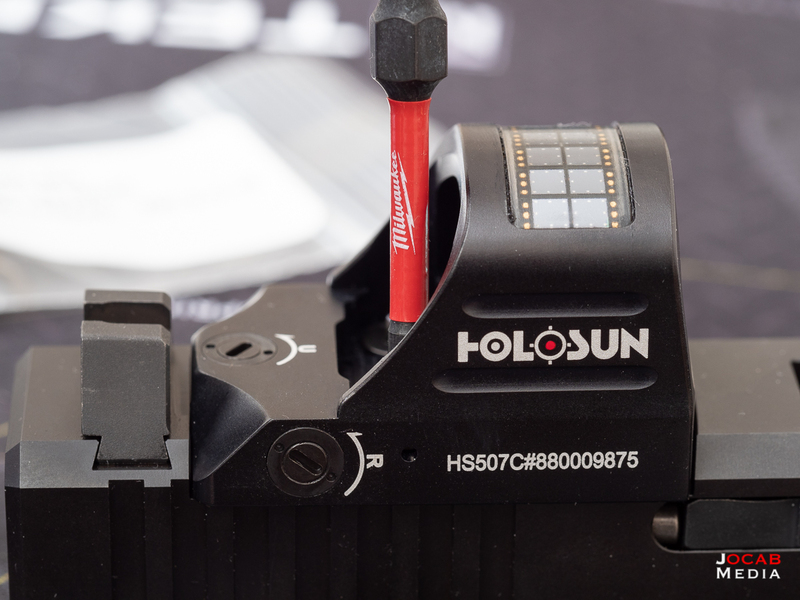 Obviously, what really matters is how the Holosun 507C handles and holds up under live fire. After running a few hundred rounds through this reconfigured Glock 19 Gen 3, there were a few observations that I immediately made on the HS507C. 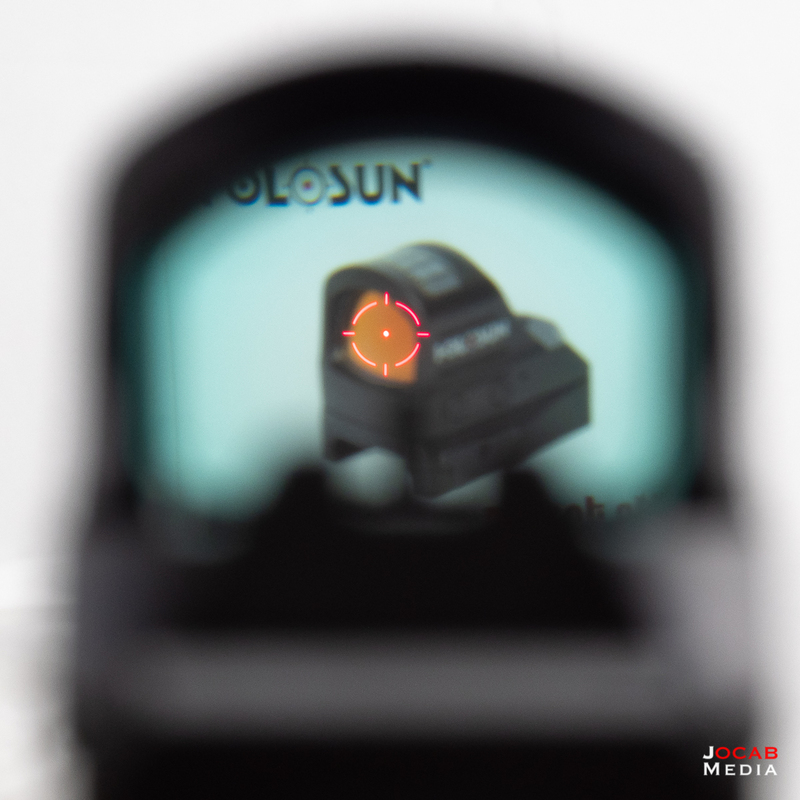 First off, the greenish tint that exists in the Trijicon RMR lens also exists in the Holosun 507C. I have not looked through an RMR for quite some time and do not have another for a side-by-side comparison, but I feel like tint is just a bit more saturated with the HS507C. For me, this is not a big deal. Second, I noticed that there is image distortion at the edges of the lens. Towards the edges of the lens, you can see the image is slightly distorted most likely because of the curvature of the lens. Again, I have not used an RMR in quite some time, but I do not recall that existing with the RMR. Just like the previous observation, this is not a problem. The image looks fine for the majority of the lens area. The adjustment controls for the elevation and windage are really small and require a small flat tipped driver. I actually do not carry a small flat tip driver in my range kit(s) and it was fortunate that I brought the box with me to the range since the tool that is included has a flat tip specifically for making the elevation and windage adjustments. As far as the clicks, the sound is audible on each click when making adjustments, but you probably need to remove your hearing protection (or use electronic). I could sort of feel the clicks, but I didn’t trust it and opted to listen for each click when I was making the adjustments. The front lens of the HS507C did take a few brass strikes. Since this is a new slide with new extractor parts and recoil spring (I used a new recoil spring since the old one was getting pretty worn), the ejection is a little spotty right now. Some brass was going straight back and a couple struck the front lens. A quick wipe of the lens revealed no damage, but the ability of the Holosun 507C to take brass impacts is going to be important. On the topic of the Brownells G19 Gen 3 RMR cut slide, the slide is actually pretty decent. I saw some feedback reviews on the Brownells product page where people complained about finish and condition issues out of the box (dings in slide, etc). As I noted earlier, I did see one small ding in the slide at the ejection port, but it wasn’t something worth complaining to Brownells about. Just keep this in mind if you decide to try out a Brownells Glock slide. I do like the front serrations. The milled serrations are relatively aggressive and will eat into the edges of the mouth of a Kydex holster, so be aware of that. 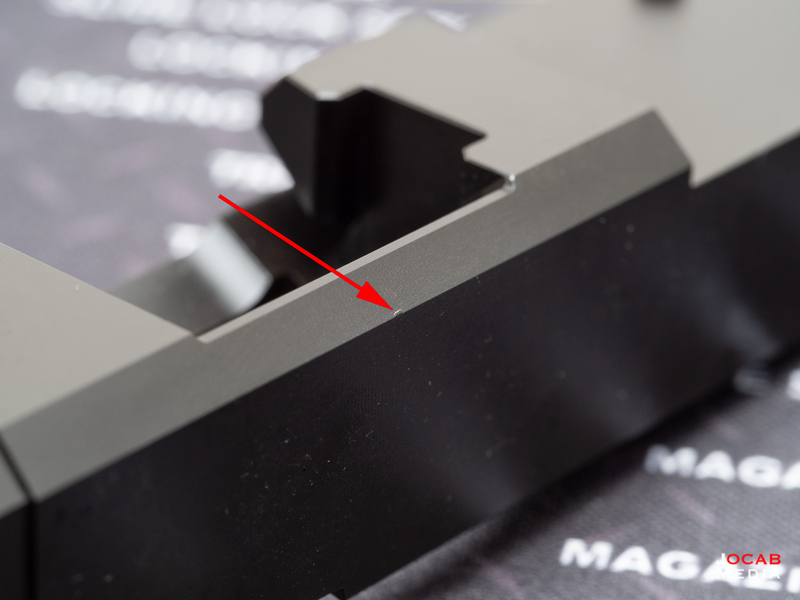 Contact marks from Kydex holster on slide. My initial impressions of the Holosun 507C are quite positive. While I only fired around 250-300 rounds, the HS507C seems to be functioning well. 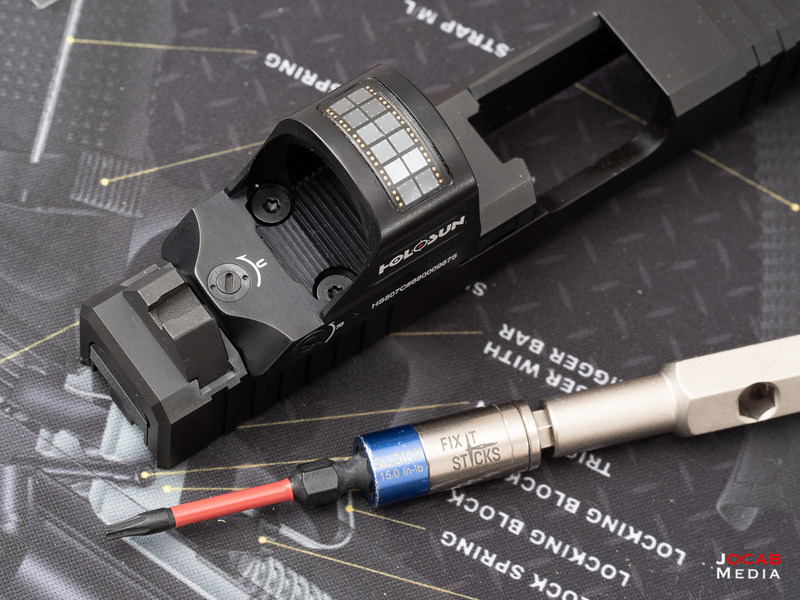 As with the RMR, time and more rounds fired will be a true test of the longevity and durability of the 507C. 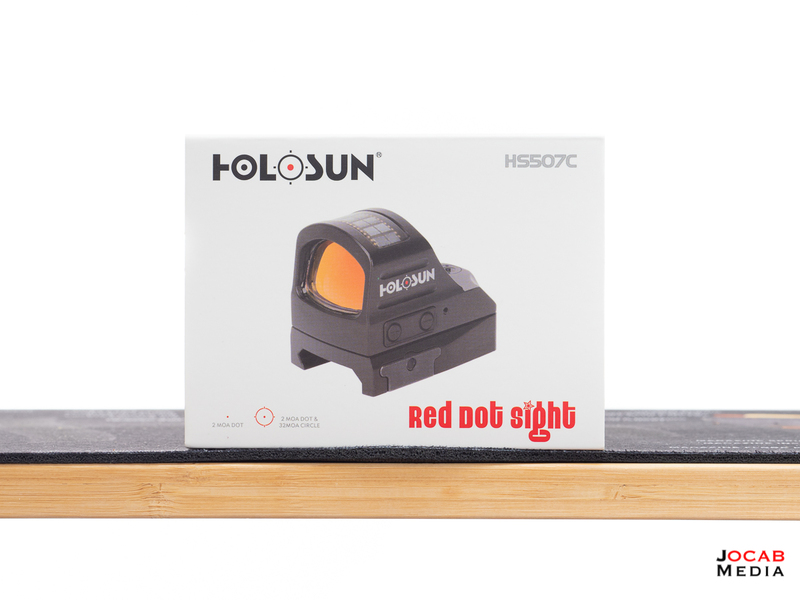 The Holosun 507C has been around for nearly a year and there are many positive reviews and opinions on this relatively inexpensive red dot reflex sight. The 2MOA dot is actually still usable on a pistol application. 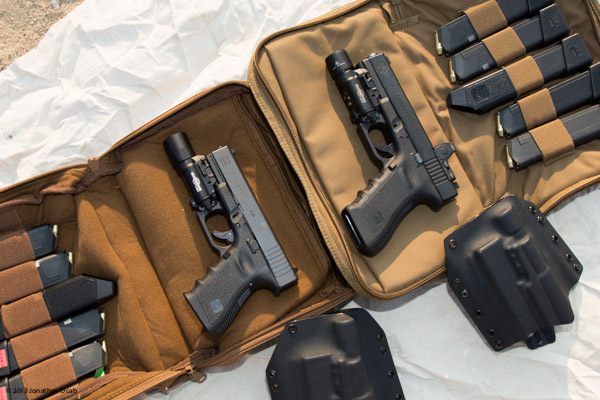 Back when I tried the Trijicon RMR on the Glock platform, I went with the RM07 which has a 6.5MOA dot due to all the recommendations that a larger dot is better for defensive pistol. I will admit that a larger dot is faster to acquire, but so far I am not having issues with red dot acquisition on the HS507C. 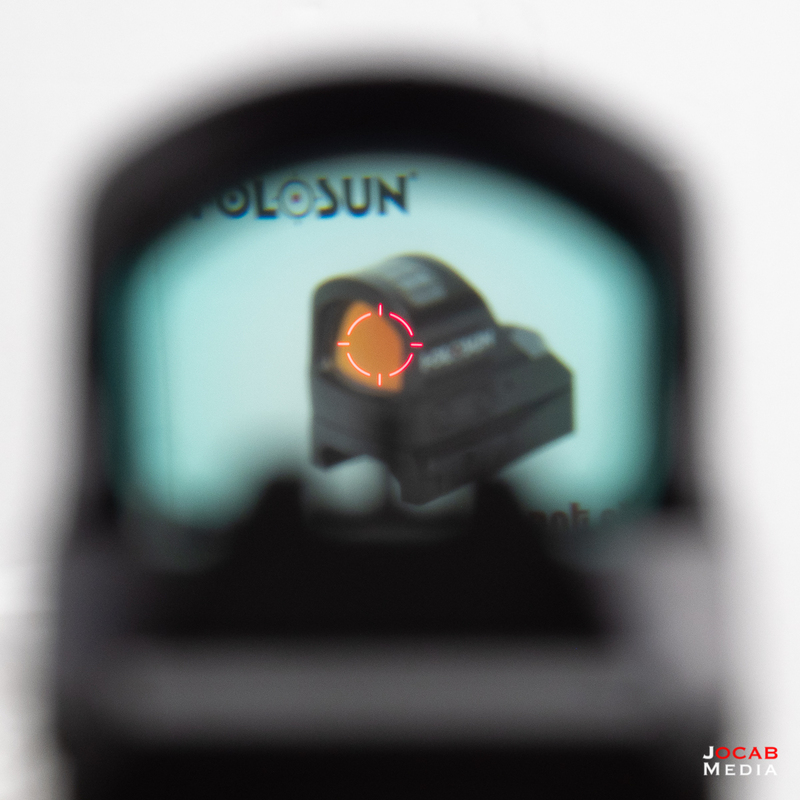 If anything, the Holosun 507C does have the larger reticle that I can select from if necessary. What’s the verdict? Well, so far so good. 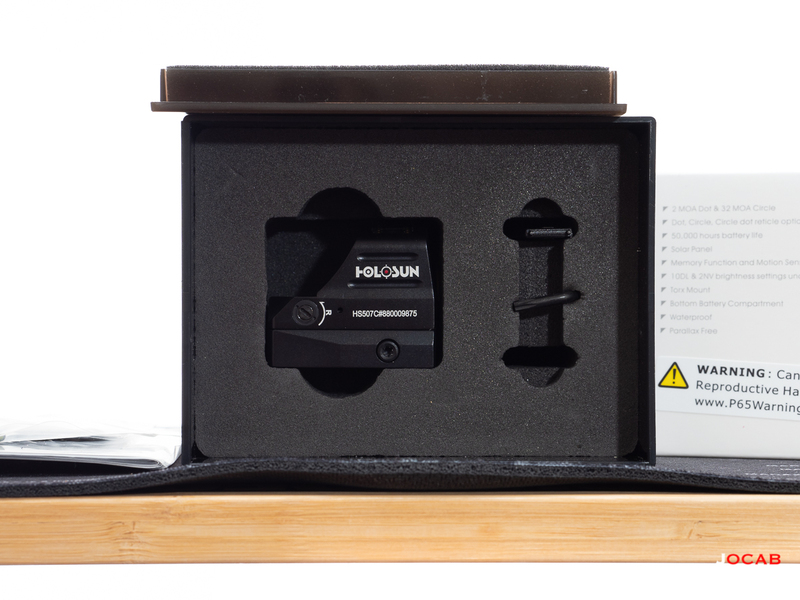 It might be too early to give a buy recommendation on the Holosun 507C given that I probably need to run 1500-2000 rounds with the HS507C before we get a more accurate durability assessment. But I like what I have experienced so far. 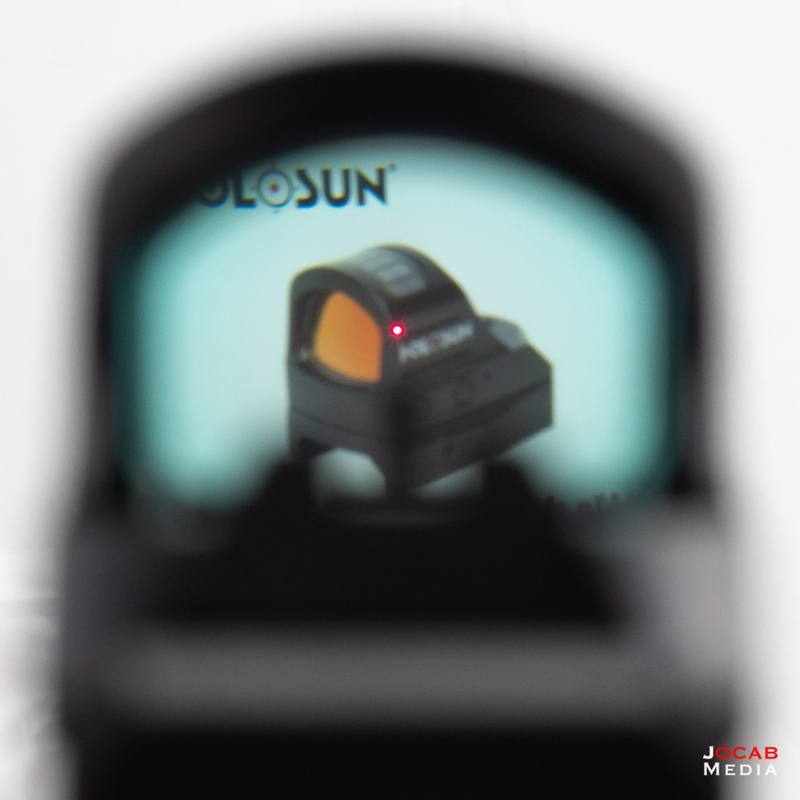 Given that the Holosun 507C is priced at $300 USD at most retailers along with the intelligent features (multiple reticles, auto-off, solar cell), the RMR footprint design, and the positive word of mouth in the community make this very difficult to pass up.